My name is Pramod Pralhad Sawant and I am raising funds for my daughter Baby Purva Pramod Sawant who is suffering from Aplastic Anemia and undergoing treatment at S.L. Raheja (Fortis) hospital at Mahim, Mumbai under the observation of Dr. Ashay Karpe. 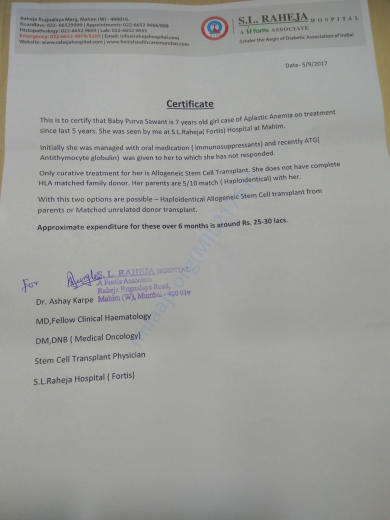 Only curative treatment for her is Allogeneic stem cell Transplant (Bone Marrow Transplant). The treatment cost would be Rs. 25,00,000 to 30,00,000 over period of 6 months. I need to raise funds to continue the treatment. I am unable to pay required amount as my current financial conditions are not supportive to pay treatment amount. Currently my yearly family income is approximately Rs. 45000. Please help us raise the required amount by sharing this fundraiser with family, friends. Please get in touch with me on +91 9423806102 for more details. Purva passed away on 30th March 2018 at 5.30 pm. She was doing fine in her before a couple of days of her demise, but her condition worsened in the morning of 30th. She was given ventilator support but her body was too weak to recover from the disease. Doctors tried their best but could not save her. We are grateful to each and every one of you who supported us selflessly. Here is an update on Purva. Currently, Purva is at home and she is doing well. Two weeks ago Purva faced serious health problems, we had to rush her to the hospital. Earlier the operation was decided to take place on the last week of this month but now doctors have advised to pre-pone the operation. 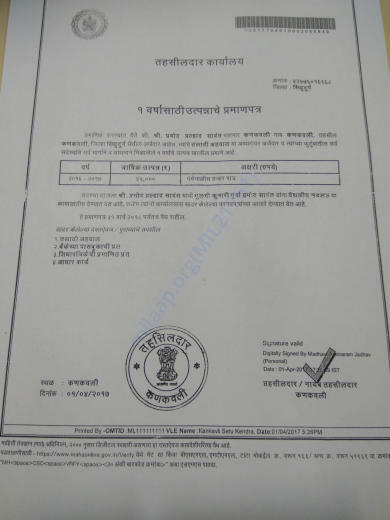 Her mother is the donor for the bone marrow transplantation. 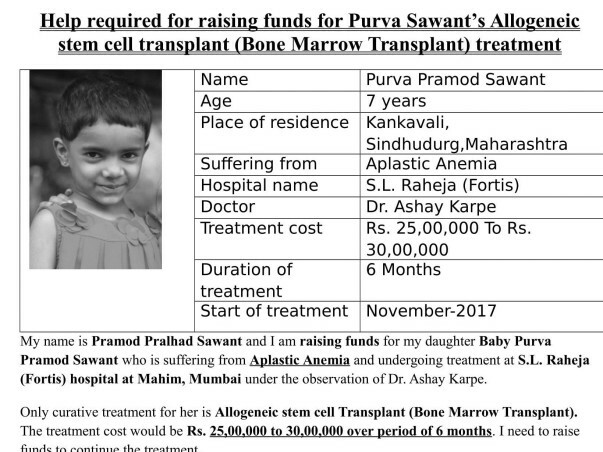 Purva will be admitted on 7th November will be kept under observation for two months. She will have to go for her regular check-ups after the operation. Thank you for your love and support. Please pray for her speedy recovery.